The Audience Building Roundtable (ABR) workshop on May 17, 2018 was “A Refresher on Audience Building Practices that Work” presented by TRG Arts, a national arts and culture consulting firm that has been presenting workshops to the ABR since the inaugural summit in November 2015. At the close of the workshop, 76 of the 103 attendees from ABR member organizations completed a survey with the following prompt: The workshop by TRG Arts provided me with at least one audience building idea that I can adapt for use in my organization. Of the 76 respondents, 60 (79%) strongly agreed with the statement and another 16 (21%) agreed with the statement. No attendees responded that they “strongly disagree,” “disagree,” or “neither agree nor disagree” with the statement. In addition to responding to the above prompt, attendees were asked to list their top three audience-building takeaways from the meeting. Below is a graph summarizing the responses; the graph is followed by a review of the top 10 takeaways from ABR members. Don’t forget baby boomers! Many highlighted the importance of engaging baby boomers in marketing and customer service. One respondent noted that the workshop indicated “baby boomers like trustworthiness, quality (consistency), [and] great customer service,” and another respondent mentioned that organizations should provide “concierge-level services” for those in that generation. Some respondents cited statistics from the workshop: 44% of boomers buy from brands they love; 74% of boomers like feeling that they are “saving” (on tickets/subscriptions) and a high percentage like social recognition. When it comes to marketing, one respondent wrote, “baby boomers are a viable group to which we should tailor our marketing.” In particular, another respondent pointed out that baby boomers respond to marketing via postal mail. During the workshop, TRG Arts conducted an exercise and provided data that illustrated why baby boomers (and genX) are viable (perhaps most viable) target audiences for arts and culture entities. Build your donor base. Another popular takeaway was that member organizations should focus on building their donor base by implementing new and/or upgrading existing donor loyalty programs, investing in donor relationships, and communicating effectively with donors and potential donors. One respondent mentioned VIP parking spaces as an example of a potential reward for big donors, while another underscored the importance of making sure that donor benefits are connected to donors’ experience with the particular arts organization. Figure out what you should stop doing. Many responded to the workshop’s suggestion that they track the time spent on organizational activities, including specific marketing and outreach, to determine the value added by those tasks. The purpose of the time tracking is to identify and stop doing the tasks that aren’t generating enough value (return on investment) for the amount of time spent by paid staff and/or volunteers. Many specifically mentioned making and implementing a “Stop Doing” list. Put a high priority on data collection and analysis. Respondents specifically mentioned hiring dedicated staff members to oversee data collection and analysis, collecting data at every opportunity, and using data to better segment and target audience members. Perform cost of sale analyses. Similar to tracking time, performing cost of sales analyses allows member organizations to identify the direct costs attributable to supplying a service and then eliminate initiatives that have a cost of sale that exceeds a certain threshold. Offer strategic discounts. Respondents suggested that peer organizations strategically offer discounts, specifically as part of postcard mailings to new-to-file patrons or as part of special loyalty packages for donors. Emphasize stellar customer service. Respondents wrote that it’s imperative to make customer service a priority in all patron interactions, from website to post-event, especially for baby boomers. Utilize Board members. Specifically, respondents mentioned that Board members could be recruited to thank new (and renewing) subscribers, members, donors, and ticket buyers. These takeaways are all important elements of an organization’s marketing strategy. Each member organization must decide which strategies best fit in their overall audience-building work, implement, track the results, and (based on results) adjust the organization’s strategy. 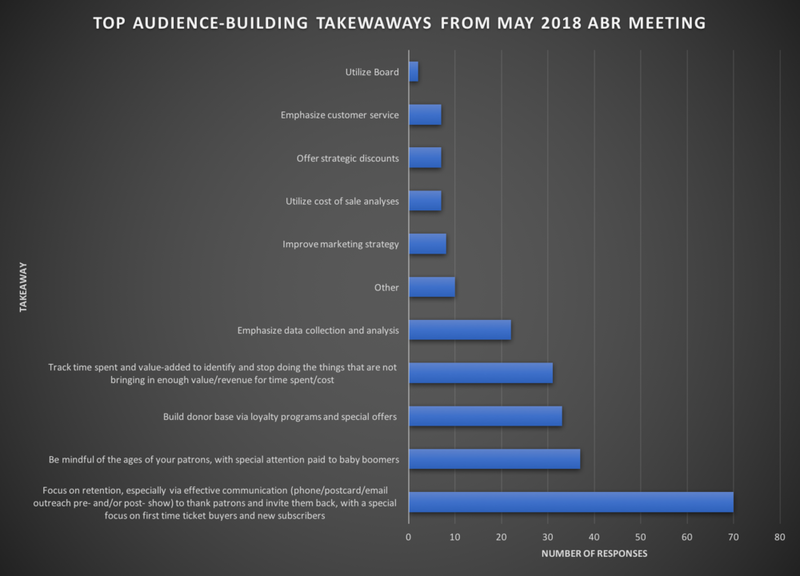 To review the presentation from the May 17, 2018, ABR workshop, visit www.audiencebuildingroundtable.org– Member Resources, then Past Meetings. You’ll find the workshop material under the May 17 date.